I'm a first generation Asian American living in Asia. (Chinese-Thai to be exact!) Let's talk about teaching English as a Foreign Language, expat life, visiting & moving to Thailand. 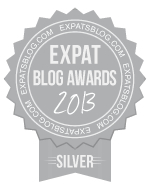 ExpatsBlog.com Expat Blog Awards 2013: Thailand Silver Award! This blog won the Silver Award for best expat blog in Thailand! I just started thinking about moving to Thailand and finding out about it. I am not a blogger usually, but this blog seems chock full of information, like a giant vitamin, or a juicy orange full of vitamin C, potassium and all the other good stuff an orange has. Especially the way it tastes. This blog just seems to taste good. But it's the first blog I've checked out about Thailand. Maybe I will eventually be disappointed but I think the bar has been set fairly high so I am not expecting that. Anyway, for now I love the juice, which I haven't even finished.